In a game littered with big plays and turnovers, a huge late-game touchdown reception by freshman Darrius Shepherd led No. 2-ranked North Dakota State (4-1, 2-0 MVFC) to a 31-28 victory over No. 10-ranked University of Northern Iowa (2-3, 0-2 MVFC) on Homecoming Saturday. Senior quarterback Carson Wentz threw four touchdowns and 335 passing yards, the fifth-most amount ever tossed in a single game for NDSU. The Panthers also picked him off twice and forced a fumble, turnovers that kept the Fargodome’s sellout crowd in the stands until the end. The 18,954 fans witnessed the Herd pull off its 26th consecutive home victory in a game that saw five lead changes in the final quarter. With the score favoring UNI 14-10, the shootout went into full swing. NDSU took its first lead in the final 15 minutes when Wentz found Jedre Cyr for a short 2-yard TD. It was the senior fullback’s second reception ever. “SportsCenter on the Road” featured Cyr before the game in a segment about the Glyndon, Minnesota native. 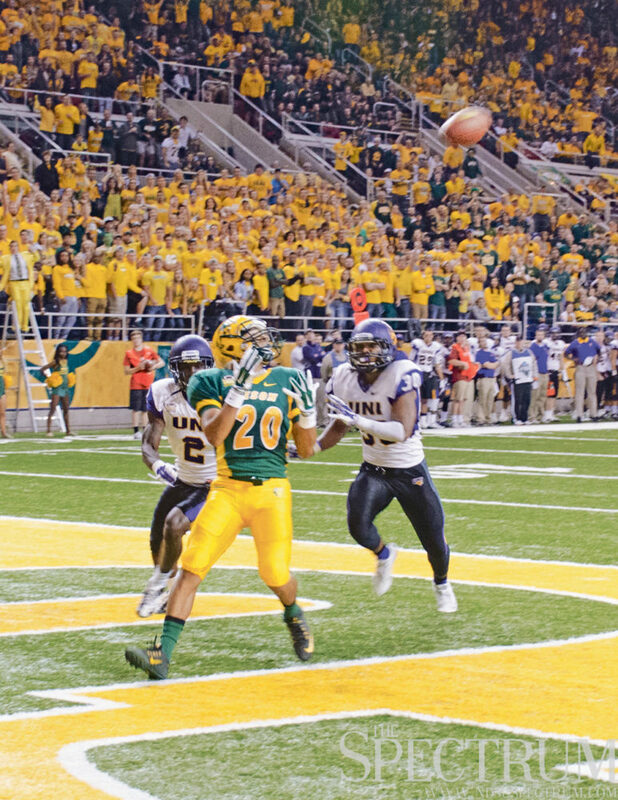 NDSU beats UNI 31-28 behind freshman Darius Shepherd’s two touchdown catches. Two minutes later, however, UNI had marched 75 yards and punch it in with a 7-yard TD run by Darrian Miller to regain the lead. Enter second-half star Shepherd, who ended the day with three receptions for 61 yards. His second reception, a 33 yards bomb from Wentz on third down caught in the back of the south end zone, gave the Bison a 24-21 lead after the extra point. Again, UNI responded quickly, this time taking all of 18 seconds before replacement quarterback Aaron Bailey ran through the Bison defense for a 83-yard touchdown. “When you miss a fit against a quarterback like Bailey, you’re going to pay for it and we did,” said head coach Chris Klieman. Bailey took over the QB-role after starter Sawyer Kollmorgen failed a concussion test right before the half. Both Bailey and Kollmorgen caused the Bison defense problems with their dual-threat ability; they were the two leading rushers for the Panthers. They combined for more rushing yards (216) than they did passing (158). The Bison’s ensuing march down the field ended abruptly when Wentz fumbled on a keeper. No harm was done, however, for UNI’s kicker Michael Schmadeke couldn’t split the uprights from 38 yards out. The Bison started their game-winning drive on its own 21-yard line with 2:30 left in the game with no timeouts. A holding call pinned the Herd to its 11 yard line, but Wentz made clutch passes again. He successfully converted on two fourth downs during the drive. And then Wentz found Shepherd again, this time with an improbable corner-of-the-end zone jump ball. “I went up for the ball, and they were trying to rip it out, but I had it,” Shepherd said of the 18-yard touchdown with 35 seconds left. 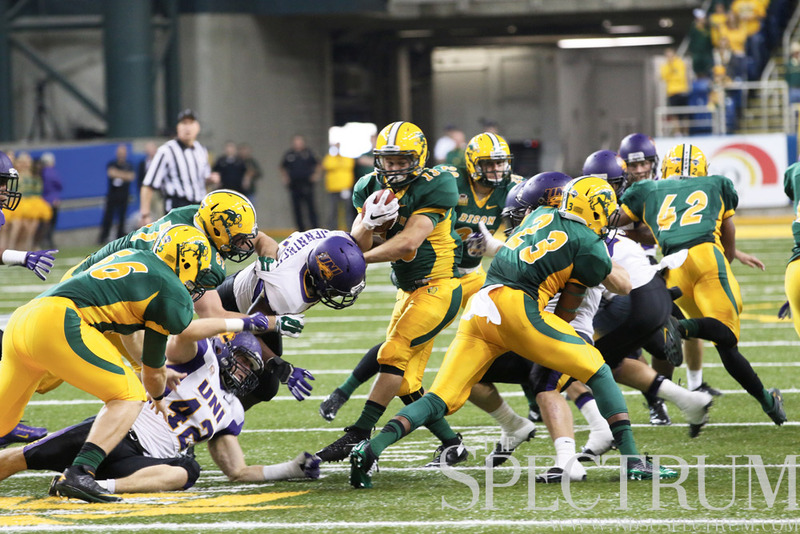 The Bison defense, which gave up 435 yards, held firm and denied a Hail Mary pass by Bailey. NDSU’s next game will be at home this Saturday when the green and gold host University of South Dakota (2-3, 0-2). Previous Previous post: Quiz: How NDSU Are You?